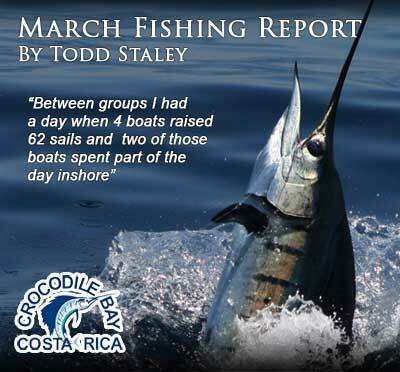 Crocodile Bay will soon open it’s doors for the 16th season of sport fishing on Costa Rica’s South Pacific coast. Since we don’t re-open until Saturday, I’ll talk a little bit about what anglers can expect in November. As always the blue marlin move in and dorado (dolphinfish) ranging 20 to 40 lbs will be here in droves. A few sails and yellowfin tuna will be in the mix. Inshore, the roosterfish will be circling the rock and also cruising around the reefs and beaches. Snapper and African pompano will be camped out on the volcanic reefs as usual. Blue Marlin like the one pictured here are historically good to target in the month of November at Crocodile Bay Resort, Costa Rica. One of the perks of this job is getting to meet tons of interesting people and sharing fishing stories, both present and past, jokes and other adventures with each other. One that comes to mind is Gene Moe who will be returning to Crocodile Bay again this season. He is lucky to be fishing anywhere. Back in 1999 while skinning a deer in Alaska a large Grizzly decided he would take out Gene and steal a meal. With only a Buck knife in his hand and no time to get to his gun, the bear attacked. After losing large chunks of flesh from his arm and leg Gene managed to get a direct hit in the vertebrate with the knife and put the bear down. Luckily he survived long enough to get medical attention, but is the only person I know of to take down a Grizzly with only a knife. While going through some old photos the other day I came across some photos of my visits to see a legend. I have always been a fan of Hemingway and probably watched the “Old Man and the Sea” a hundred times as a kid. I still watch it now and then. Before coming down to Puerto Jimenez, Costa Rica to help start Crocodile Bay Resort with the Williams family, I had a friend here in Costa Rica who kept a boat in Hemingway Marina in Havana. When he asked if I could check on his boat a couple times a month I jumped at the chance. One of the things I have always done when I travel somewhere is walk up to the oldest people I see on the street and start up a conversation. That is the best way to get a real picture of the place. I soon found everyone was eager to talk about Hemingway, his boat the Pilar, was on display at the Hemingway home and museum. I also found out Hemingway’s captain Gregorio Fuentes was still alive at 100 years old and living in his home in Cojimar and accepted visitors. As I arrived in Cojimar the first time I was awed by seeing the same castle I had seen in the “Old Man and the Sea” standing proudly on the water’s edge. The locals directed me to the home of Gregorio and my hand trembled as I knocked on the door knowing I was about to be face to face with a legend. As we sat in his living room I saw the years on the ocean in his eyes and spots of skin cancer on this nose. We sat for several hours and talked fishing, marlin, and of course Hemingway. Locals had told me that Gregorio and Hemingway would argue a lot about fishing technique, where to fish and so forth. As I pressed Gregorio he was a true professional and never admitted whether that was true or not. He did tell me that Hemingway did have a true disgust for sharks, especially when one stole a prized fish. Gregorio demonstrated his sense of humor when I asked him how to live to be 100 years old. I often chuckle as I recall his secret. “Every day before dinner,” he started, “I have just two shots of rum, after dinner a good cigar and every once in a while a young woman.” I laughed and thought to myself, at 100, what’s a young woman, 80? Over the next years I visited Gregorio many times. Each time I left with a feeling like I actually knew Hemingway. I have not been back to the Island since coming to Jimenez 16 years ago. The legend Captain Gregorio Fuentes passed shortly after in January of 2002 at 104 years old. I am glad I came across those old photos. It made it all fresh again. I look forward to this coming season to see old friends and meet new ones and of course chewing the fat with them after a days fishing. We’re looking forward to our 16th season at Crocodile Bay Resort, Costa Rica and hope we get to see you this next year. Watch “Crocodile Bay in 60 Seconds” to learn more about sport fishing at Crocodile Bay Resort, Costa Rica. Crocodile Bay Resort just finished hosting the 30th Club Amateur de Pesca annual sailfish tournament with teams from South Africa, Guatemala, Mexico, Costa Rica, Puerto Rico, and the United States competing. In four days of fishing the group of 10 boats raised over 300 billfish and landed a total of 150 billfish including several blue marlins which is amazing because all anglers were required to fish 20 lb test line and had a maximum of 30 minutes to land a fish. The closest I have ever felt to walking with royalty was walking the pier each day with 86 year old Nora Scholfield. Nora was fishing her 28th tournament and is one of the pioneers of sport fishing in Costa Rica. Nora hooked two marlin on day two of the tournament and nearly landed a 250 pounder in the required 30 minutes. The 500 pound fish she hooked later wasn’t about to give her the same chance. Guatemala ended up taking first place, with South Africa second and Puerto Rico third. Franz Hoffman of Guatemala tied Puerto Rico’s Bruno Rodriquez for the most fish, but Hoffman took home the trophy because he landed his last fish earlier in the day than Rodriquez. The tournament atmosphere was a change for Crocodile Bay Captains who generally fish for fun although each wants to be on top of the scoreboard posted in the bar each evening. Freddy Navarro was top captain, followed by Edwin Cerdes and Chepe Conteras. My blood pressure has dropped 20 points, which means things are getting back to normal. The crazy weather patterns last month in the states came all the way south, but this month the skies are blue and both temperature and the fishing is hot. Allen Ryals and Steve Ulman have been coming here since before my hair turned gray. Allen is sort of a professor of fish and an inventor of many types of fishing gadgets. This year it was a teaser made from a bowling pin that he had to fine tune to keep out of the gutter but when he finished it was running straight and true. He and Ulman also customized a cedar plug that made the big tuna dizzy. Pat Robbins brought his seven brothers down for their second reunion at Crocodile. The boys were raised in Butte Montana along with 4 sisters. By the time they finished high school all had been taught the welding trade by their father and all used those skills to attend college. Now the mix of brothers are either in the medical field or in metal casting doing business in the states and Costa Rica. They caught a list of nice fish including wahoo (which have been strangely prevalent lately) and brother Bert landed an 80 lb tarpon on light tackle after a two hour battle. Our small population of tarpon have made their way through the Panama Canal from the Atlantic side and slipped into Pacific waters without getting their passport stamped. Bob Perimian’s group hit it just right. Although Bob couldn’t make the trip his crew raised an average of 10 fish per boat a day and caught some real nice snapper for dinner. Fishing has really picked up for sails. Between groups I had a day when 4 boats raised 62 sails and two of those boats spent part of the day inshore. A few marlin have made a presence and Doug Ford from Houston finished his trip with a nice blue marlin. Kirk Dill had his group down again from Bermuda and Tony Thompson made his annual trek from the Big Apple and found out he was neighbors with part of the Perimian group. There were so many repeat guests these last two weeks that I know I forgot someone so please forgive me if I make you feel like the bridesmaid. Inshore has been extremely well for snapper and cuberas over 20 have been a regular thing as well as roosterfish. There has been the best snapper bite going on that I can remember and part might be the shrimp boats are no longer working in the gulf. Major League Baseball Hall of Famer Wade Boggs Poses With a Nice Wahoo on His Third Visit to Crocodile Bay Resort! February has been one of those month’s that drive fishing directors crazy. One day the fishing is red hot and the next it’s not. On the good moon the fishing slowed and on the normally not so good moon it picked up. Tuna have passed through occasionally, cruising with the porpoises. Lots of 60 to 100 pound fish were caught that some made it to sushi plates. Greg Thompson and David Horn teamed up to tackle one that went around 180 lbs. They opted for sails after that battle. Sailfish is what is driving us crazy. One day we see as many as 15 per boat and the next only a half dozen. We have had more rain than any February I remember and more cloudy days and the bite always seems better on a sunny day. The Annual Vergith Contracting Fishing Tournament was held earlier this month. Royce Cook finished first in points and Joe Vincent and Mark Bass tied for second only a half point behind Cook. The 10 anglers went 28 for 75 on sails and landed 17 dorado and 2 tuna. Eight of the ten anglers took their first sailfish during the tournament. Ludwing Diaz, general manager of the Hotel Balmoral in San Jose and a big supporter of fishing tourism and sustainable fishing practices was down with wife Katherine and 11 year old daughter Juliana. They spent a day fishing and snorkeling taking several nice African pompano and roosterfish. Inshore has also had it’s ups and downs but yesterday the roosters were crowing in full force. A couple of fish between 40 and 60 lbs were caught along with many in the 20 pound class. Enough snapper hit the dock these days for the chef to prepare in several different fashions. One cubera snapper estimated at 50 lbs was released. The bigger fish are almost always female of breeding stock. It didn’t matter your age lately, you were having fun catching fish here. Five year old Matthew Norguero got his first snapper off our pier, eleven year old Eddy Robles took a nice African Pompano reef fishing and Pat Morgan celebrated her 79th birthday by catching her first, second , and third sailfish! Her husband Henry took two sails and a nice dorado. Texans Mike and Catherine Shellman were so pleased with their results that they left a caricature in the bar. Mike took a sailfish on the fly and Catherine hauled in a super 50# roosterfish. Scott “the kid” Barbeau and his wife Stephanie were down from Massachusetts. Scott is one of those guys who fishing runs through their veins. He chases tuna in the rough Atlantic and wanted to do the same in the calm Pacific. After I told him we haven’t seen a big tuna in a while he proceeded to bring me a 100 plus pounder back to the dock. No matter what he targeted he did well. I don’t know how many different varieties of fish he caught but I’m sure he is someplace ice fishing about now. The dorado are starting to thin and the sailfish numbers are starting to pick up. All this is normal although it is happening a little late this year. A few marlin to 400 pounds are surprising anglers and the tuna are running when the porpoise come through. The sails have been hungry and ready charge a pitch bait or a fly. Inshore has been unpredictable with the roosters biting like crazy one day and going into hiding the next. Several from 45 to 60 pounds have been the highlights. Bottom fishing has been good but should even get better between the moons. Jeff Vannoy fishing out of Crocodile Bay went looking for roosterfish near Matapalo Rock and although he didn’t get his roosterfish he certainly caught something to crow about. The crew and Jeff were surprised to see a 120 plus pound tarpon take to the air when Vannoy set the hook. After over an hour on 20lb spin tackle they lifted the fish for a quick photo and set it free. 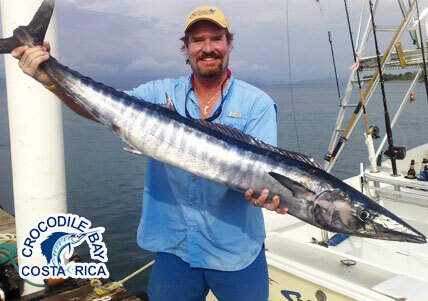 December was a great month for fishing at Crocodile Bay, Costa Rica. Since our first guests of the season, Tom and Anne Bobotas walked in on the first of December, chatter around the bar at happy hour has been fish, fish, fish. The fishing season started out with lots of dorado and Tom was happy he out fished all the guys on the big boats, topping it off with a monster dorado (see below). The last two weeks of the month the sails made a sporadic appearance and some boats raised as many as nine but the big wave of sails are due to arrive any day. My bratwurst connection from the midwest, John and CJ Mork fishing with first time friends Joe and Peggy Schierl tangled with a nice blue marlin as well as sails and dorado. John has taken a marlin each visit here. The marlin finally showed the third week of the month and there are stories of battles lost and battles won almost every afternoon. Inshore has picked up considerably lately with rooster up to 60 lbs making people crow. Dennis Cook was down with his triplets, Mackenzie, Dawson, and Asher and had a ball inshore with roosters and jacks. Long time guests Andrew Ociepka and Al Charles also had big days on roosterfish. As we come off the big moon of New Years eve, the sail numbers should increase greatly in January and the snapper bite will turn on with the slower tides.